Galloway and Porter, 30 Sidney Street, (near entrance to Sidney Sussex College and opposite Sainsbury's supermarket) - reduced and second hand books; particularly good selection of L1 new paperbacks (fiction & non fiction) in the entrance, plus travel guide books, art, academic, children's etc - virtually everything inside, including a surprisingly high percentage of books published in Australia, which isn't very usual in UK bookshops." Galloway and Porter is mostly famous for its unusually low prices on a wide range of titles. The bookshop originally offered exclusively new books but it is currently specialized in second-hand books and reduced or remainder titles. It has gained a reputation of the best source for not only fiction titles at prices which can not be matched but also for academic books, which even attract university students from London. Once or twice a month, special Saturday sales are held at the Galloway and Porter warehouse, located at 347G Cherry Hinton Road in Cambridge, where most of the titles are sold for 1£. 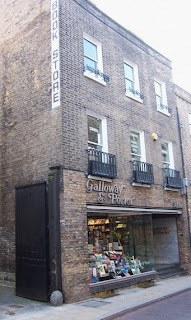 This bookshop also belongs to the rare 100 and plus years club - it was established in 1902 and it still carries the name of its two founders Sidney Galloway and Charles Porter although Mr. Galloway left to start his own bookshop soon after and the original Galloway and Porter is actually run by the third generation of the Porter family. During its whole existence, the bookshop has remained in its original location at 30 Sidney Street in the center of Cambridge. Galloway and Porter spreads on three floors - the basement is home to their collection of fiction, but it also houses books on travel and gardening, the ground floor is the place to search for books on art, cooking, or children’s books and the first floor focuses on non-fiction titles covering the humanity field but also medicine, technology and lots of other subjects. Low prices, a great stock which gets renewed very often and a staff service which gets praise from practically all the customers - add it all together and the final result comes pretty close to our idea of an ideal bookstore. many bookstores closing these days..